August 28, 2007 Olivia Merriam McClure passed away. She is grieved by her mother Lisa, father Darin, skin-sister Ella and doggie sister Pretty, cat brother Citrus, and the two fish really don't care because they can't see through the algae bloom to even know she is gone. Olivia was born in a closet in Burlington, Vermont. Born from a stray that my friend Tammy had rescued I agreed to take her in when our friend Catherine's landlord would not allow her to keep her. Named Olivia before I even saw her I took her home and for 16 1/2 years she was my loyal companion as well as my first pet I ever had as an "adult." 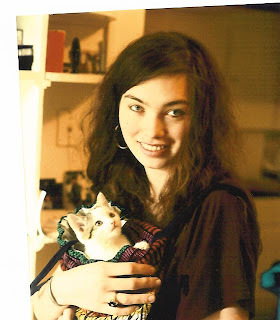 In Burlington Olivia was known as the kitty in the bag, as she used to travel with me in a little backpack that I had converted into a kind of baby bag. She and I lived above a little cafe called City Market Cafe. I used to work at the cafe and Olivia and I would stop in and they would slice little bits of ham and turkey for her. At the time I was a waitress at a sushi bar and Olivia was always given fresh salmon sashimi by the sushi chefs when we would pop in together. After our first year in Vermont Olivia flew on a plane with me to Seattle. In Seattle we had many adventures together. She has also travelled cross country twice by car. Travelled back and forth between LA and Seattle by car. Olivia loved to travel and all I had to do was set her box out and she would hop in and make herself comfortable. Olivia in later years loved to vacation in Ojai where she could relax and watch Orioles. Olivia has walked all the way around a building on a ledge 6 stories above street level. Olivia has caught one mouse in her lifetime, in the window well of our apartment in Seattle. Olivia is named after a soap opera character. Olivia was once attacked by a pit bull and when I pulled her out of his mouth and lifted her to the top of a cement wall to safety she promptly jumped down and attacked the pitt bull's face. In retrospect I realize that we were both VERY lucky we didn't get mauled. At age 12 Olivia had hyperthyroidism and was sent to a special hospital in Irvine where she was shot up with radio active iodine to kill a tumor. For 10 days she remained radioactive and I had to flush her poo down the toilet. Olivia found her final home in San Clemente. She would sit outside by the street and warmly greet passers by. On one occation she followed us on our way down to the pier. Later we discovered signs with a hand drawn picture of a cat looking much like Olivia with the caption "Cat Found ... Possibly Pregnant." We laughed and said ... "gee that almost looks like Olivia." It was, she was returned, and all was well. I will miss my kitten. I will miss her walking with me down the street, her motorized purr, and the way she would reach out and set her paw on my hand. She was a loving and loyal cat. She will be greatly missed.